A beauty, yes? While we were on the Isle of Skye, Cathy stopped our car to photograph sheep in the field. It seems that my friend can't get enough of photographing sheep. 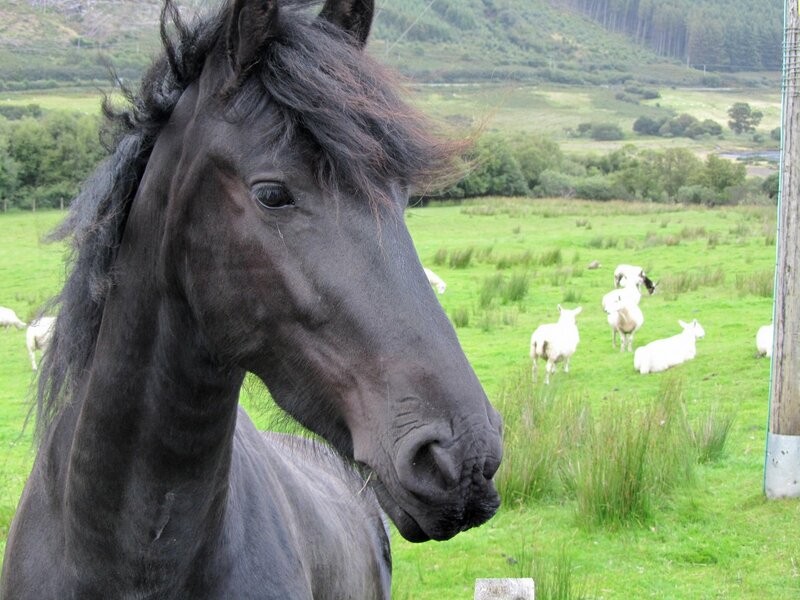 Sharing the field with the sheep was the beautiful horse pictured above. When we approached the fence, she (I believe) came to us. That's Cathy's arm and hand in the picture above. Beauty (my name for her) seemed eager for our touch. We both patted and stroked her, and she seemed to revel in the affection. Beauty was eating the grass over on my side of the fence, and I pulled the grass and began to feed her. Very gently, she took the grass from me with her velvety lips and ate. 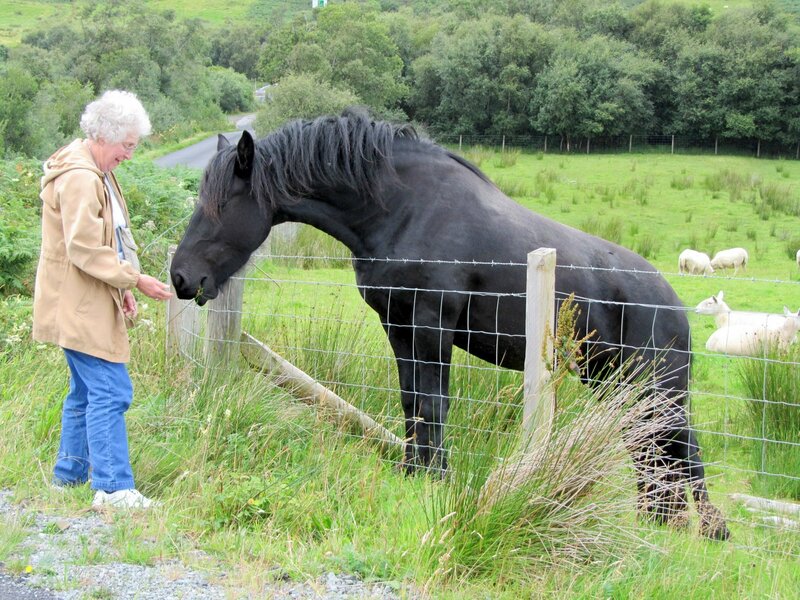 Well, I suppose it doesn't take much for me to find magic, because surely having Beauty eat from my hand was a magical moment on the Isle of Skye. The top and bottom pictures are Cathy's, and the middle photo is mine. What a beautiful moment that must have been! I always feel that I am doubly blessed when I experience a relational moment with an animal. Thank you for sharing this gift. Non-human animals bring us so much magic and glory. We just walked a fence-line where the cattle apparently fell in love with our wonder dog. Followed her up and down the fence line. I think of soul and body meeting soul and body and communicating in a lovely way without words. I am quite keen on photographing sheep. Ahem. The horse did come to us - I think she thought we must be the bearers of horse treats. Alas, we had none. 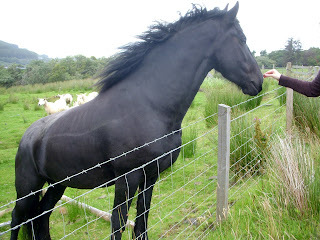 She was a lovely horse though. And not at all savage or temperamental, as a certain chauffeur may have implied all horses are. And it's strange that I was not at all bored while we were on Skye, although we had been warned by MadChauffeur that we would be. Yes, it is indeed mysterious, and paradoxical, that though Skye is apparently a dreadfully boring place, we were not bored. What a stunningly beautiful horse. And, yes, the encounter does sound truly magical. Ellie, what a moment! I won't soon forget Beauty. I think MP was trying to scare you off to cut down on the number of tourists. He probably would like it for himself. JCF, it warms my heart that you love Beauty, too. Amelia, MadChauffeur left us before we went to Skye. That tells me something.